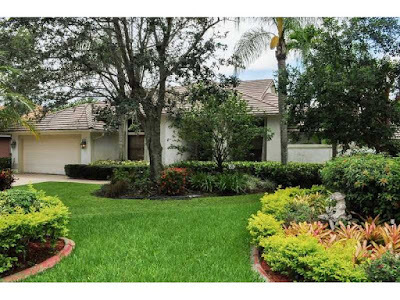 Broward Real Estate: Charming Home For Sale In The Isles Of Weston! This is a charming home on a prime cul de sac in the prestigious Isles At Weston located in the sun soaked city of Weston. This west facing lake view gem has so many glorious features. The gorgeous sparkling salt water swimming pool features an emerald pebble tech finish. The chef's gourmet kitchen has been updated with new hand crafted maple wood cabinets, a full suite of stainless steel appliances, sleek granite counter tops and a back splash. This one story home with five bedrooms and two and a half bathrooms is perfectly laid out on over three thousand and four hundred square feet of elegantly furnished living space. The newly tiled master suite with the adjoining office overlooks the private backyard oasis and lake view. This master suite features his and hers walk-in closets, separate sinks and jetted tub with separate large shower! There is gorgeous walnut flooring. 1087 Deerwood Lane is located in Weston and is currently asking $649,000.00. The residents of Isles At Weston have great shopping, dining, and entertainment in close proximity at nearby Weston Town Center. The awesome beaches are just a short drive from this envious community.